With these settings, you can add a surcharge for credit card payments. 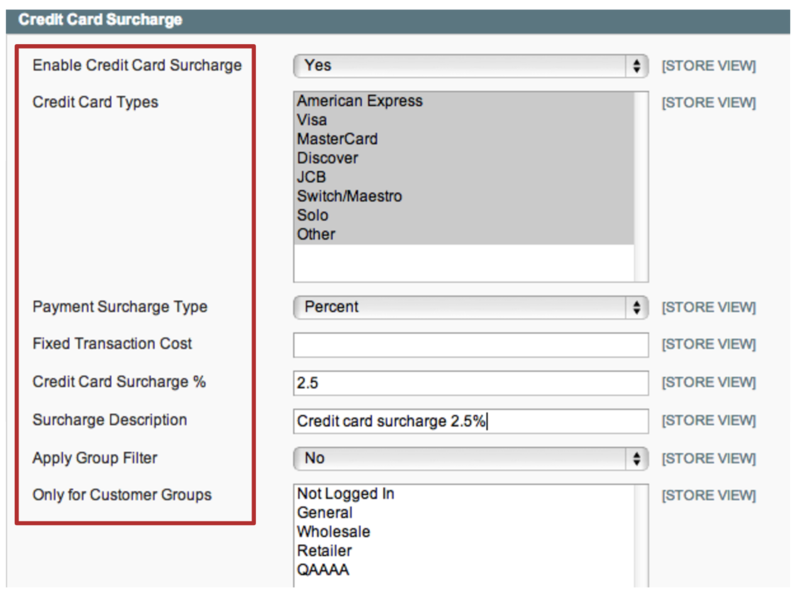 To set up two separate surcharge settings for different credit card types, use the different setting groups in “Credit Card Surcharge” and “Credit Card Surcharge 2”. A credit card surcharge can only be applied if your store uses a payment solution where customers enter credit card details on your website, rather than an external payment solution. Please check your credit card contractual agreement to check whether you are permitted to apply a payment surcharge, as this varies from country to country and from payment provider to payment provider. If applying different surcharge amounts to different credit cards type, we recommend including in an appropriate place in your store the respective charges for different credit card types, so your customers won't be surprised by any surcharge. When set to Yes, credit card surcharges will be enabled. Control-click to select as many credit card types that you wish to apply the surcharge to. Enter the fixed transaction cost you wish to charge - eg. 10 (remember not to add any currency symbols). Enter the surcharge description that will be visible to the customer – eg. “Credit card surcharge 2.5%”. Can I apply a surcharge only on specific credit card types (eg. only on American Express cards)? Can I apply a surcharge only to payment by credit cards, and not to debit cards?